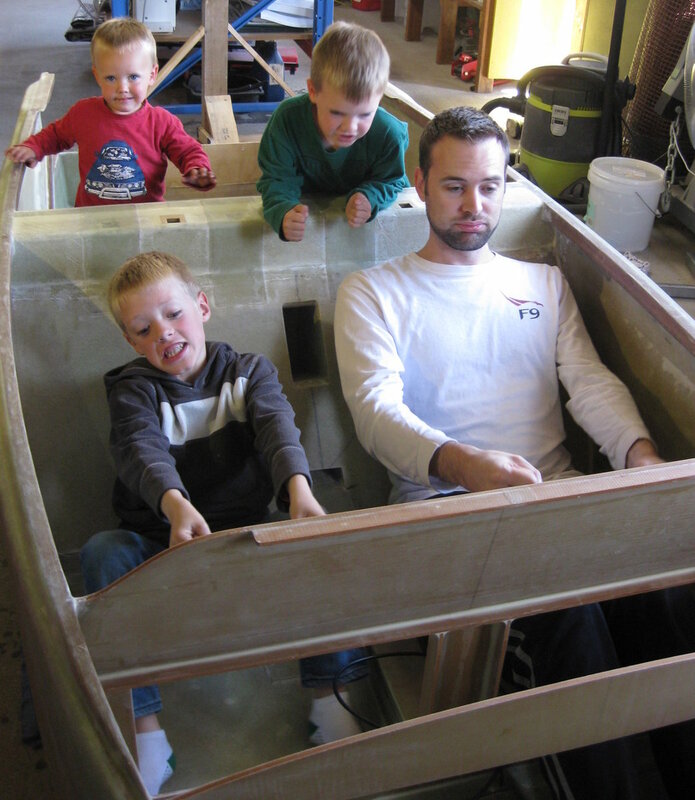 I have a website to record my build progress over at www.canardspeed.com, but it is woefully out of date. So I figured I might post here from time to time. I might get some useful feedback to boot! I am building from Aerocanard plans, but with a few modifications that will mean it will not be called an Aerocanard or a Cozy when complete. You'll probably notice a few differences as we go along! Most notably so far, the fuselage is 6" wider at the front seatback, smoothly tapering to standard Aerocanard FG width at the firewall (a bit wider than a Cozy) and intersecting the standard nose profile at around F-10 forward. Today was plane day, though I had some stuff to do that meant I didn't use the whole day. 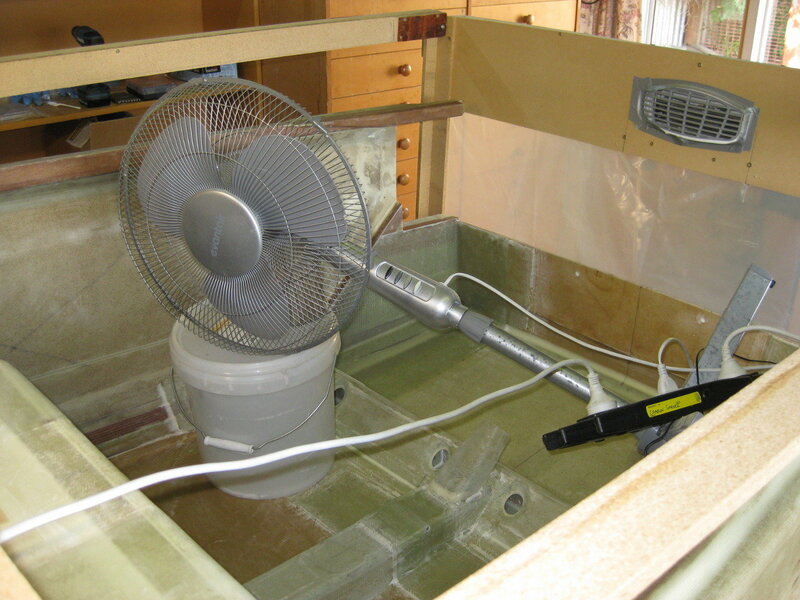 The task was to fabricate and install the outboard seatbelt reinforcements. As you'll see, I have twice as many as per-plans (I know, I know, they came back down when I threw them up in the air!). The reason for the extras further forward in the front seat is in case Beagle ever flies with me so that he can sit far enough forward to reach the panel because I will be installing 6-point harnesses in the front seats. The extras in the back seat area are for securing heavy items in this area, such as auxiliary fuel tanks for trans-oceanic operations (which are more likely to be used when one is located on an island in the South Pacific!). The ply inserts came out nicely, and were easier to make than I first anticipated. Almost a shame to cover them up with so much glass! Floxed into the front seat-area. 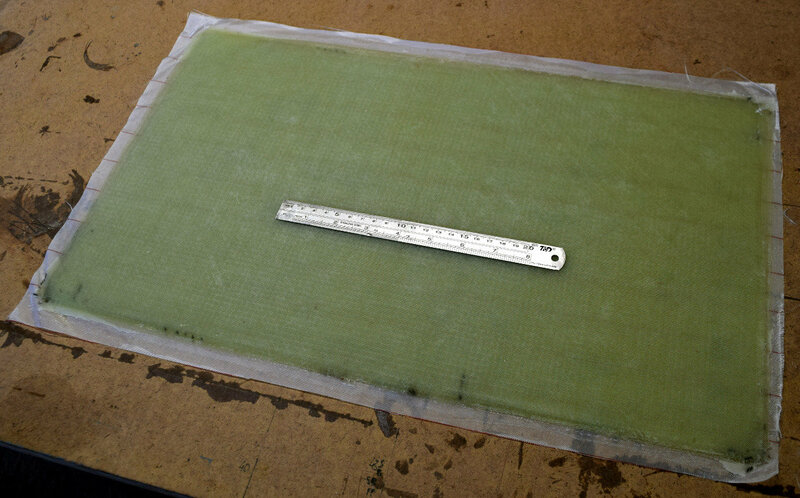 Pressing them into place, the excess flox squeezed out and the inserts became satisfyingly rigid in their locations. 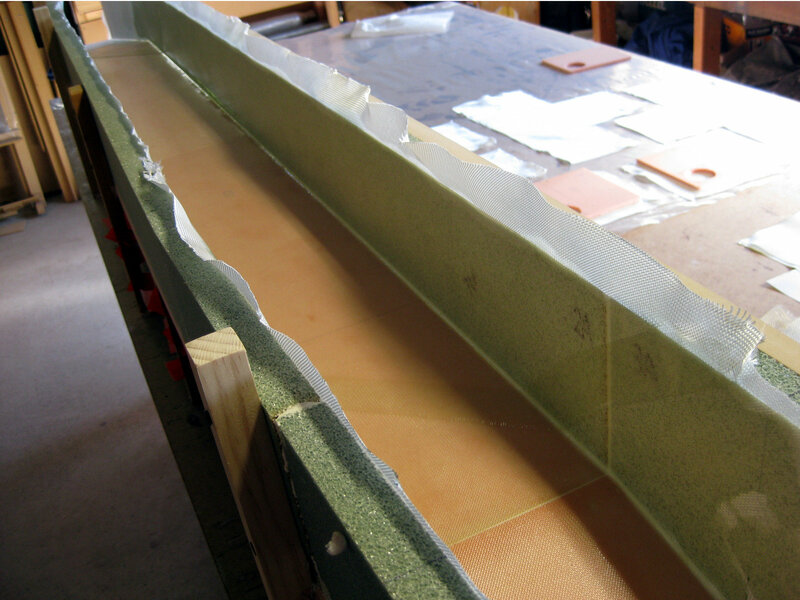 Rear hardpoints glassed and peel-plied. The white along the edges of some of the tapes joining the floor to the fuselage is a result of being unexpectedly interrupted before I could peel-ply those tapes. That certainly added a lot of time to the build as I dealt with all those tape edges! And a few bloodied fingers (all mine) along the way too. So I've left it now to cure. 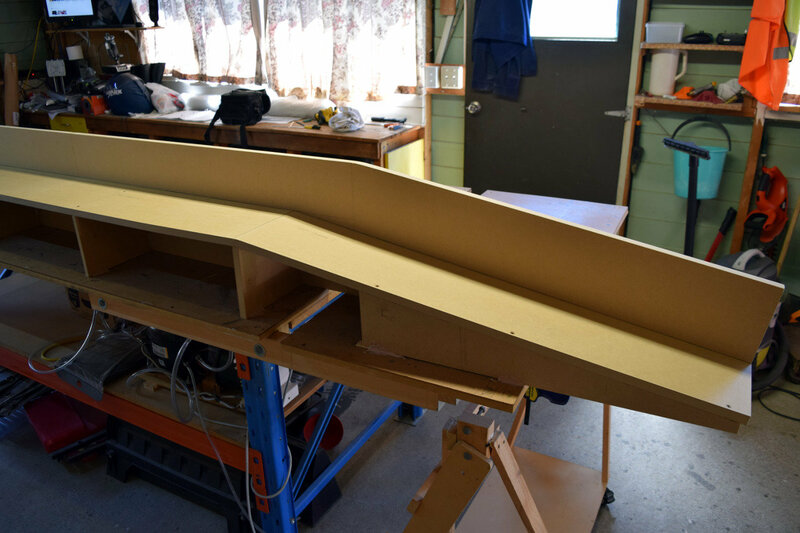 Almost done with the fuselage tub! Good. I see that Canardspeed.com has disappeared anyway. The work looks good. Interested in see more. People have no idea how many little beautiful parts go in to and get buried in one of these birds.... good job on the seatbelt parts! Then I shall share more. Glad the site is down - my host decided to move all sites to another provider that was worse and did not honour the original terms (or everything that was paid for), so I've let both my sites expire. Curiously the other one is still up! I'll be re-launching on a new host when I get a round tuit (anyone have plans for making these?). So true. And thanks for the feedback, they came out nicely. I know it has been said plenty of times before, but I really do look at the project as a long series of small parts, and I enjoy building each one. I swear, after spending an hour or so in my workshop, I am more energized and motivated to get back to whatever else I need to do (like making a living!). I swear, after spending an hour or so in my workshop, I am more energized and motivated to get back to whatever else I need to do (like making a living!). Totally agree.... Truly enjoy building this project... wonder whats next? 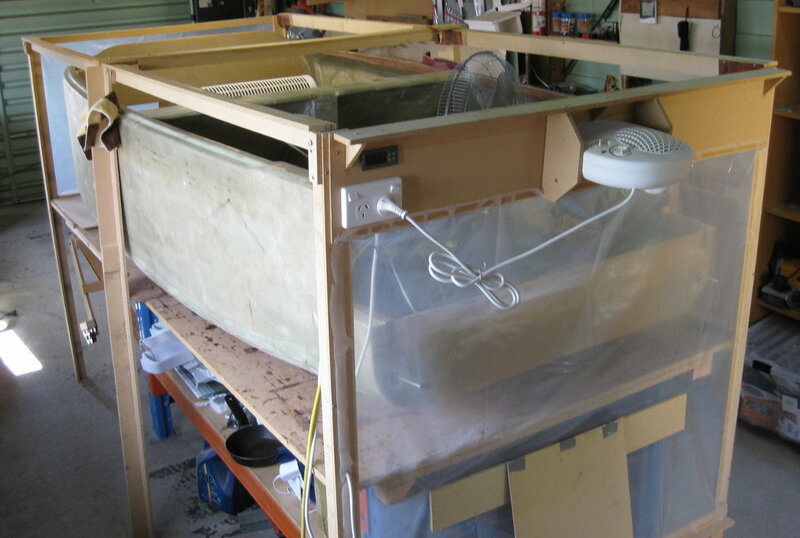 Tub complete (except a few touch-ups and repair to the rotisserie mounting holes). 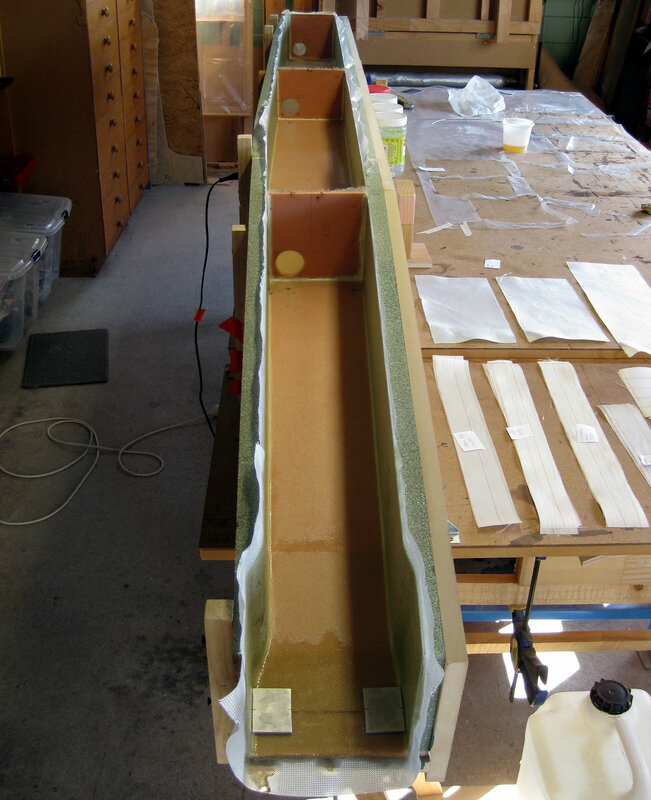 Intending to get started on the centre section spar next, as I have all the materials needed to do so already. That's nice. I hope you get it finished before they leave for college. ? At least two need to move out of home by then (another is on the way) so I have enough seats for everyone!!! Of course, it is fun to be able to sit in it now and imagine. It is also encouraging that this collection of parts that were pretty fragile in their incomplete state not long ago is quite tough and robust now. Good for confidence - not that I doubted before. It's cake day! Well, not quite - I'm baking a Cozy tub! 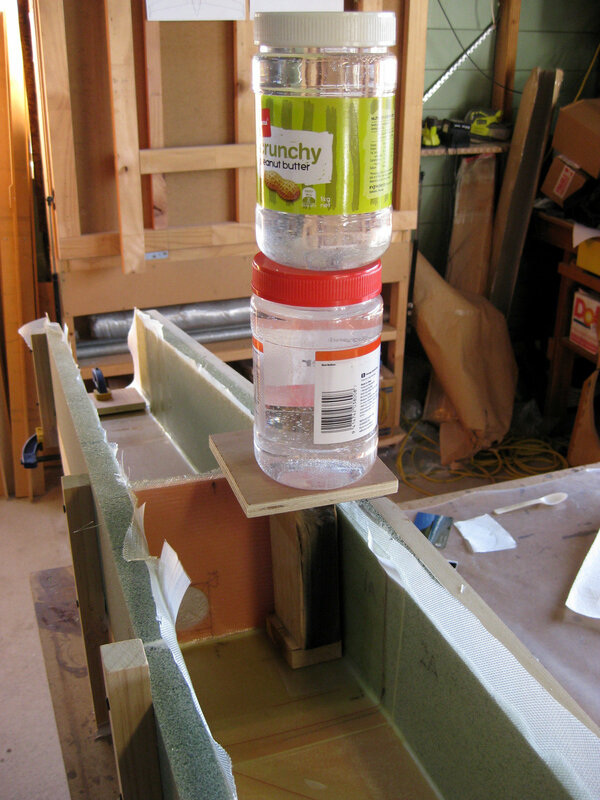 I set the tub on the workbench on two lateral 'rails' to leave some air-space underneath. 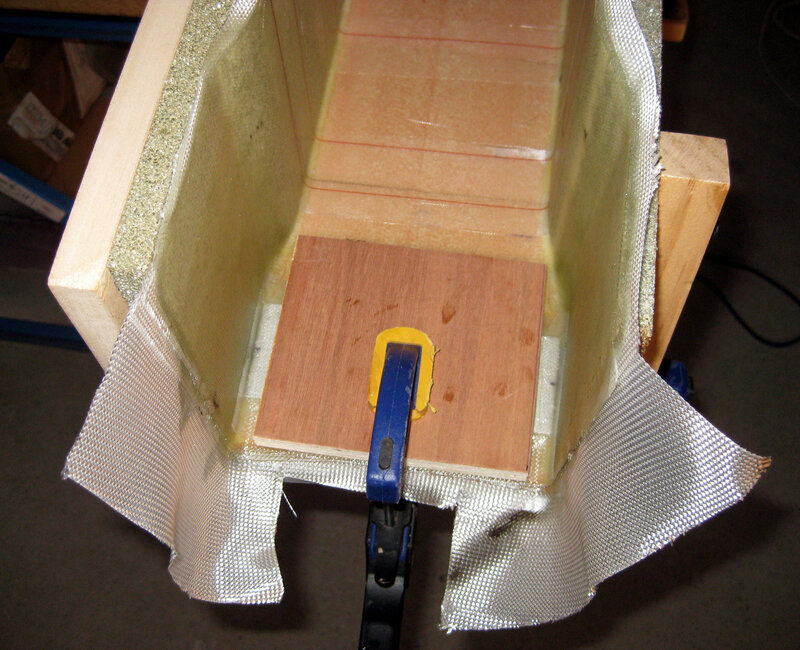 I used thick rags between the wooden rails and the fuselage bottom to provide some thermal insulation to avoid a 'cool spot' where the wood will wick away heat into the workbench. 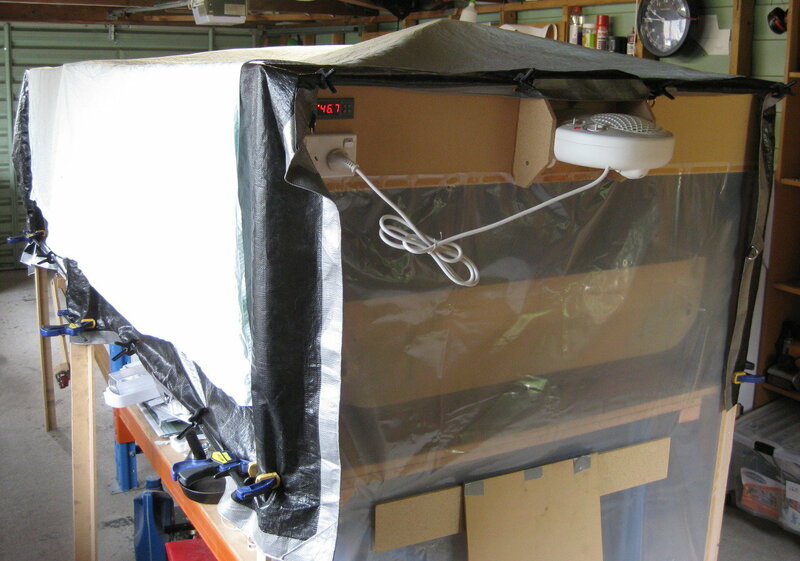 The frame of the heat-tent fits around the workbench, with transparent plastic panels at each end, and a 2kw fan heater mounted in the aft end of the heat tent. 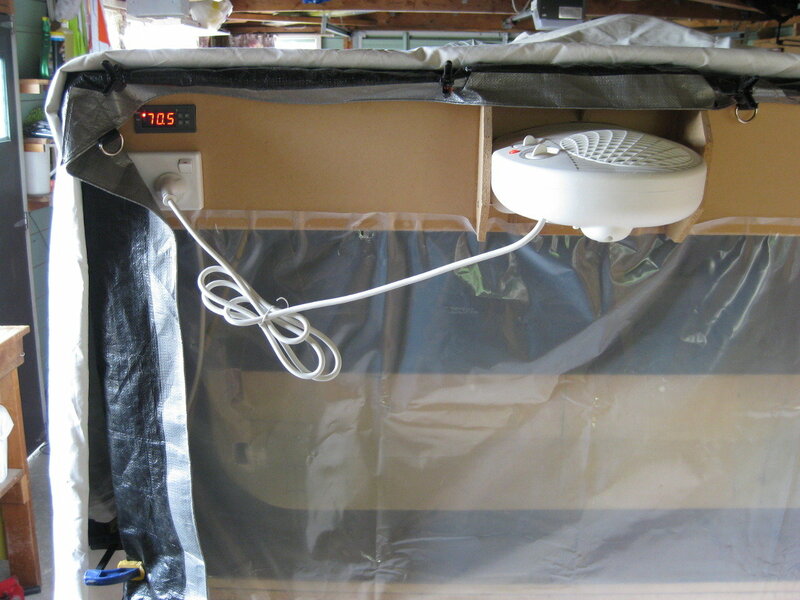 The same end has a temperature controller that the fan heater is plugged into, and a temperature sensor that I clipped about 6 inches above the floor in the backseat area. 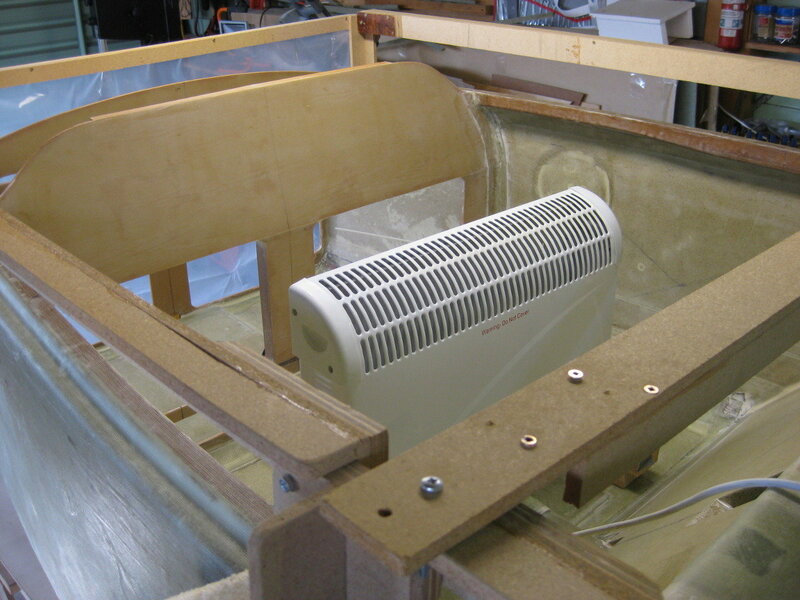 I placed a 2kw convection heater (safety circuit disabled - it had failed previously so I just bypassed it) in the front seat area, and a floor fan in the backseat area blowing forward and to one side to circulate the heated air and keep the temperature in there more even, as well as to help the warm air make its way around the exterior of the fuselage. The photo shows the rough positioning, I moved things around a bit and ensured there was no strain or stress on the cables before beginning. With everything in place I covered the entire apparatus with a tarp clipped to the edges to mostly seal it up (the fan heater draws in air from outside the tent, providing a positive pressure and forcing the coolest air at the bottom out of the small gaps), and some sheets and canvas I had around on top of that for insulation. Power-on, and gradually step-up the temperature, 35c (95f) for an hour, then 55c (130f) for an hour, then to the max target of 70c (158f) for 6 hours. It is still baking as I type. The convection heater is running at partial load, 1.2kw, and the 2kw fan heater cycles on and off to maintain 70c. So I have lots of margin heat-wise, which is nice. If nothing else, I know I will be able to spill hot avgas in the cockpit without harming the structure! ? Your kids will grow up fast. My Son was an 8th grader when I started building. By the time I was flying he was in college and the flying I anticipated with him never happened. I see that you joined Canard Aviation in June 2012 it was in June 2014 that a wet-behind-the-ears-Voidhawk first asked about materials in your hemisphere http://forum.canardaviation.com/showpost.php?p=74868&amp;postcount=1 so it has been 6.5 years since you became interested in building. Don't get mad at me. I am only interested in seeing people finish their projects and get flying. ? There are too many builders sitting on fantastic unfinished projects or they put 250 hours on them and age-out of flying. Good luck, my friend. Not mad at all, I appreciate the feedback. 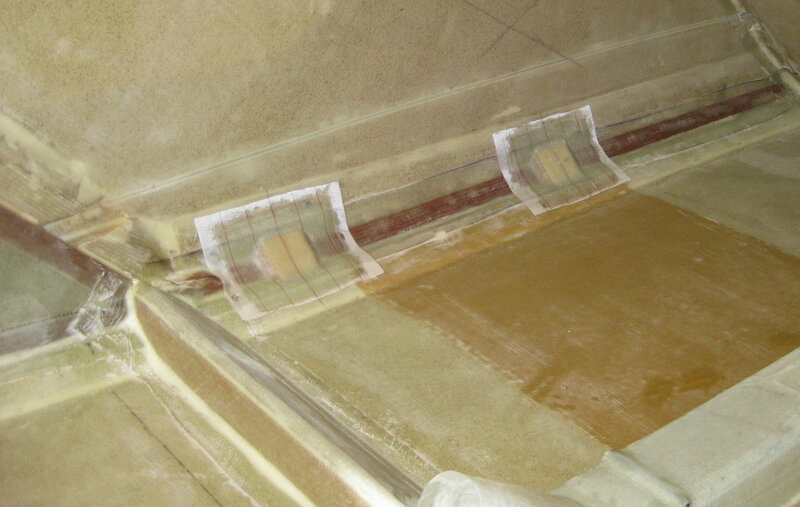 The post cure is recommended for this epoxy system, so I believe that is a good reason to do it. Once I got it set up (an hour? ), I only checked on it from time to time while working in my office, so it was not a big time-sink, perhaps 2-3 hours total. Due to life circumstances (2x career changes, house moves, etc), it did take me until 2016 before I was able to lay-up my first actual parts in Chapter 4. I first seriously started considering building following the CSA BBQ at Osh 2011. In the intervening time, I managed to read through most of the e-mail list archives, forums, many builders logs, etc. so it was not all time lost! It has been slow since then as well, largely due to work and another house move, and of course, the kids have to come before the project; my marriage is also a higher priority, which I have seen is not the case for some, to their detriment. But the pace is picking up and I'm hoping to move much more quickly in the year ahead. There are more disruptions on the horizon, but I'll keep doing what I can when I can rather than wait for everything to be perfect. I'll see you at a fly-in (with my airplane) sometime in the mid-2020s! 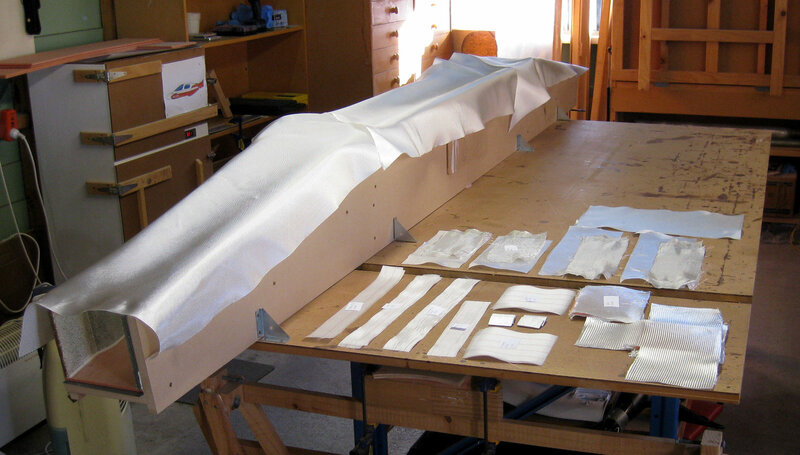 I had a warped winglet once and thought maybe I could put it out in the sun in a black plastic bag with some weights and get it straight. It wouldn't budge. It leads me to believe that once things cure at room temperature, they are fairly stout. I hope I live that long! ? I hope so too, that's only a few years away! While I do not think the structure would fail if I didn't postcure, it is recommended by the manufacturer. As per Slide 32, manufacturers recommendations should be followed. The last couple of months I didn't get much done on the project due to higher priority projects that are now complete. I learned a new dance move this week. I call it the 'spar jig'. The supports under the end are a bit different to plans to ensure stiffness of the jig hanging off the end of my slightly short table. 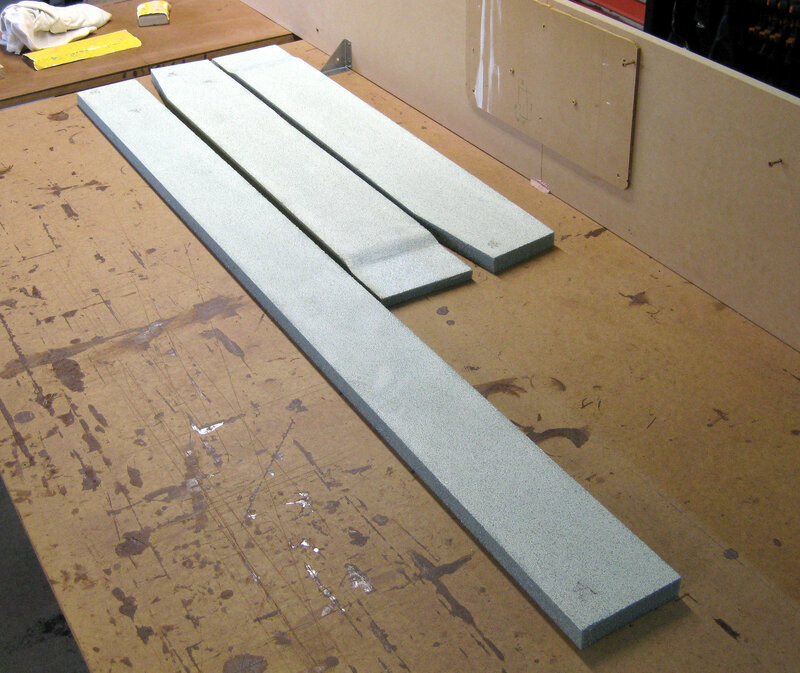 Actually probably easier to do it this way anyway, since the long support is the off-cut from the big back panel. Also slightly visible is my 'cheap little sucker' vacuum system under the bench. It works great. 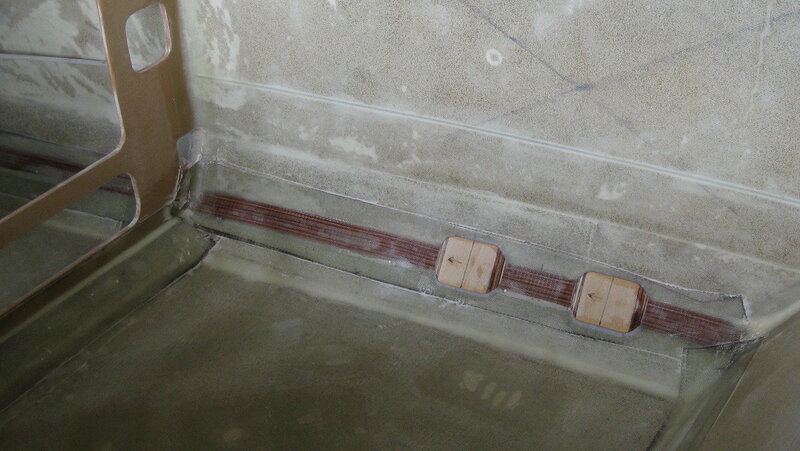 I also laid up the crush plate required for installing the Infinity Retracts. Came out nicely. 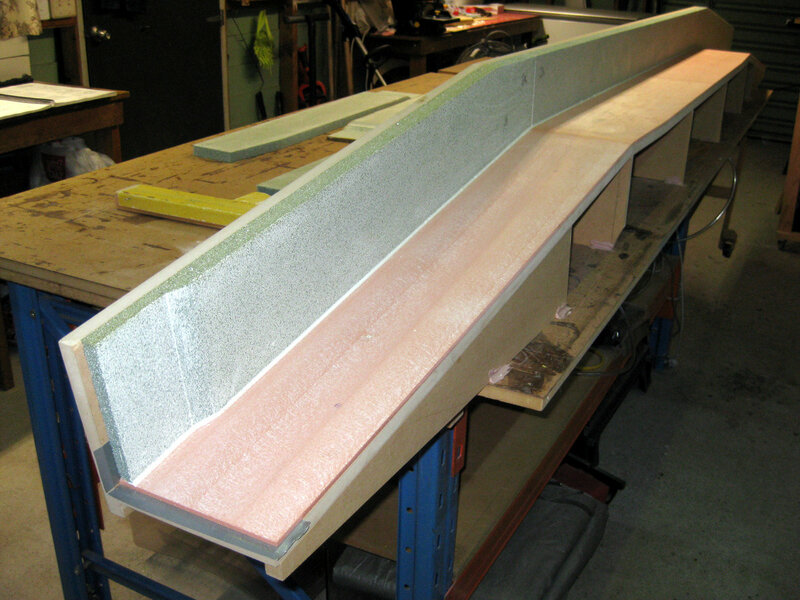 It will be cut in half (lengthwise) and trimmed to fit basically in place of the foam in the front face of the end of the spar. That's a short list! Outside of NZ, everywhere is far away, and I am not aware of anyone in NZ right now that would need one. Most builders over here are building aircraft capable of rough-field operation, which is sensible given the rarity of runways over here. I'll just fly high enough to glide to one most of the time. Yes, it seems a shame to ditch these carefully built jigs, so I hold on to them intact as long as practical. 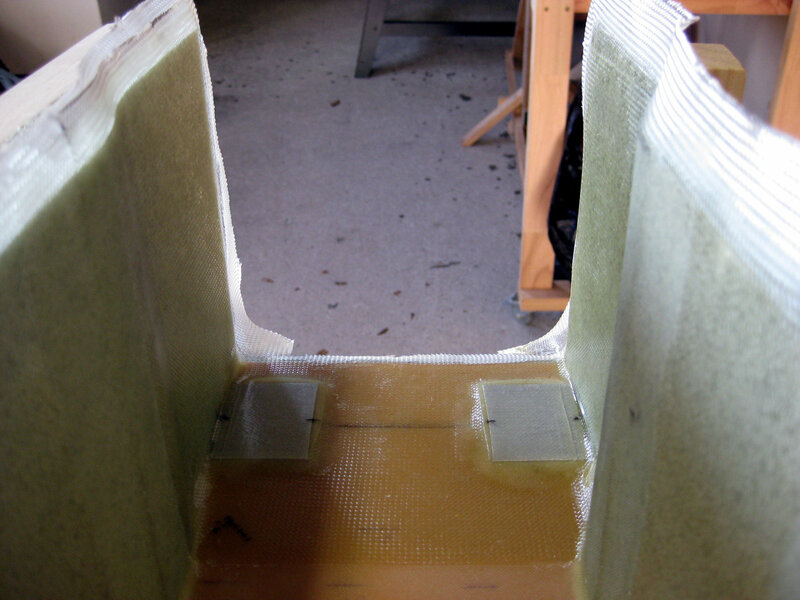 Parts of the fuselage side jig came in useful once I finished the tub, it is presently stored on its side using a side jig with some foam tape on it to protect the glass, and covered with a tarp. Another slow couple of months for progress. 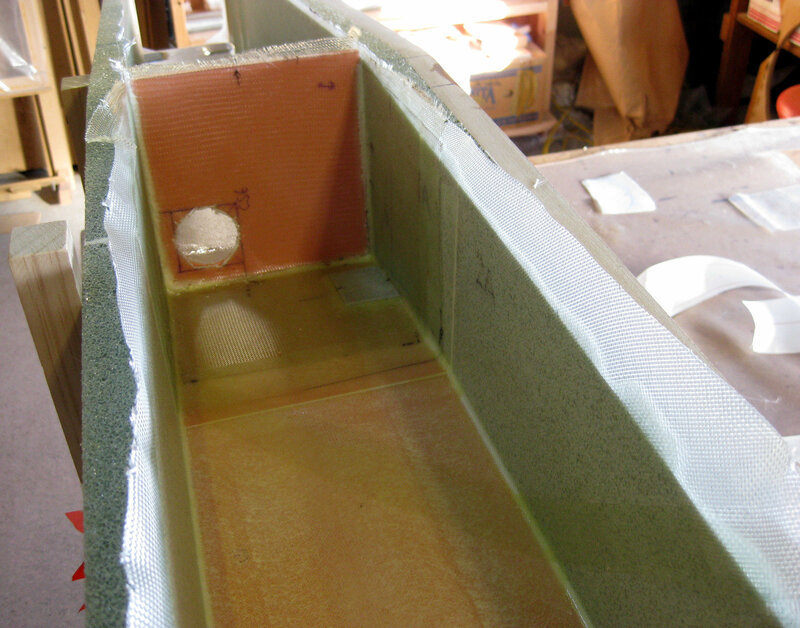 I had the foam all done and joined and everything ready for the spar interior layups. But since I needed most of a day to get all that done, I had to hold there, as I was waiting for a very short-notice report that my wife was about to have a baby; "can you wait till four, darling, while I finish these layups that must be done together?" Family first! Photos of the spar construction to date. Click for larger images. 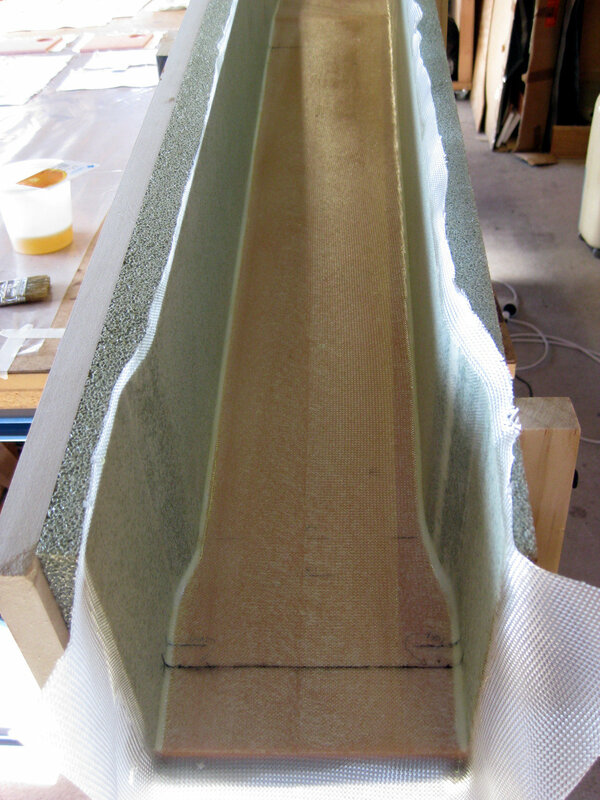 Foam parts prepped and being installed. 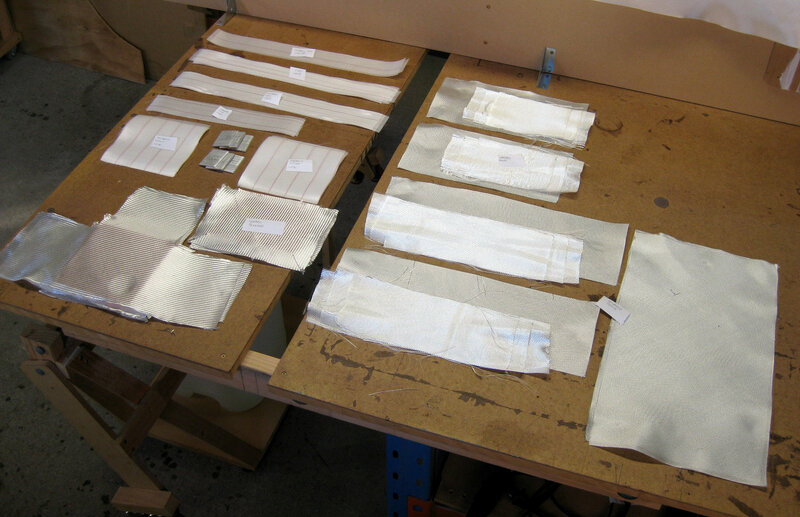 Glass and peel ply cut and labelled ready to easily find and apply. A few extra pieces of peel- ply that I didn't need in the end, but easier to have prepped and ready in advance in the event that I do. Glass in the process of being wet-out. Weight on the wing attach hardpoints. As you can see, I didn't install the end caps bulkheads yet. As I will be installing Infinity retracts (I don't own a set yet - budget limited! ), I will need access into this area when installing the fixed parts of the gear, so the end bulkheads will go on once that is done. 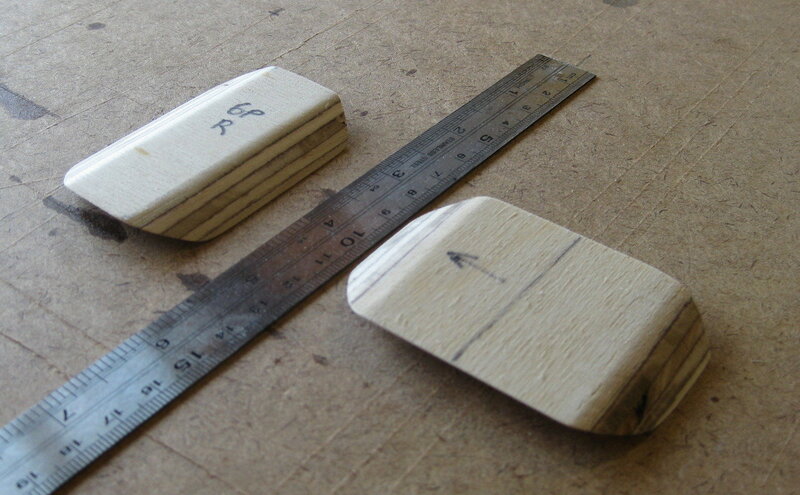 This also made it very easy to weigh down the outboard hardpoints, as I could just clamp down on them. 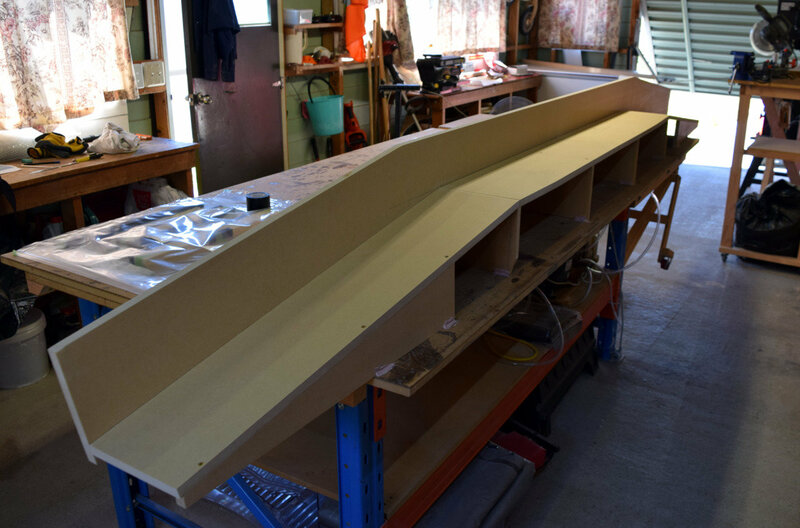 The inboard hardpoints had approx 5lb on each per plans. 1l peanut butter jars filled with water =1kg each plus the weight of the stand= approx 5lb. After cure, but before trimming. It came out nicely.